Today Quique Dacosta is the chef of a restaurant that is called by his same name and considered by many, particularly after the closure of Ferran Adria’s elBulli to be one of the new leaders of avant-garde cuisine in Spain. He has won awards and accolades and his restaurant has been awarded the coveted three Michelin stars. Unlike most chefs who have travelled the world and worked in various kitchens, Dacosta has only worked in one place, his restaurant. He started working there at the age of 17. It was in 1989 and he joined a family restaurant by the name of El Poblet. 10 years later, he bought the restaurant in Denia, close to Alicante and Valencia and from then on there was no turning back. It is only now that it is fashionable to look for supplies closeby. “The 80km that surround us constitute a dream for any chef. The area is sensational and for me to be able to make full use of the produce which surrounds our restaurant, I would need to live 500 years,” he says. The restaurant is just a stone’s throw away from the Mediterranean sea. “The Mediterranean is more than just a diet or a sea. It is a window to a world which is rich in culture and which has shaped our heritage and culinary discourse,” he said at Chef’s Revolution in Zwolle. Da Costa speaks passionately about his work. “The best moments of my life are when I am with people who share my passion for cooking. I could never have dreamt of sharing my passion with so many people when I started work. My work allows me to be serene and to come up with some great creations. Quique da Costa prepared three dishes during his presentation. The first one was an intriguing dish of seaweed, tobacco leaf, red tuna, dashi and sesame mayonnaise. Dacosta said that in his home town of Estremadura they used to produce tobacco. “In Spain we have very fresh seaweed which is excellent. What we do is that we use it to prepare a jelly and then we dry and caramelise it. We then smoke it and put it in the oven. Once its ready it reminds us of a dried tobacco leaf but with a salty taste. This vessel becomes the plate on which the dish is served. He then uses red tuna, leek, dashi and a black sesame mayonnaise to finish off the plate which is served as a tapa and is meant to be eaten by hand. A second dish prepared was a tomato water, eel, vodka infused celery, dill oil and frozen kefir. He says that this dish is not really from the Mediterranean because seafood and cheese do not go together in Mediterranean culture. 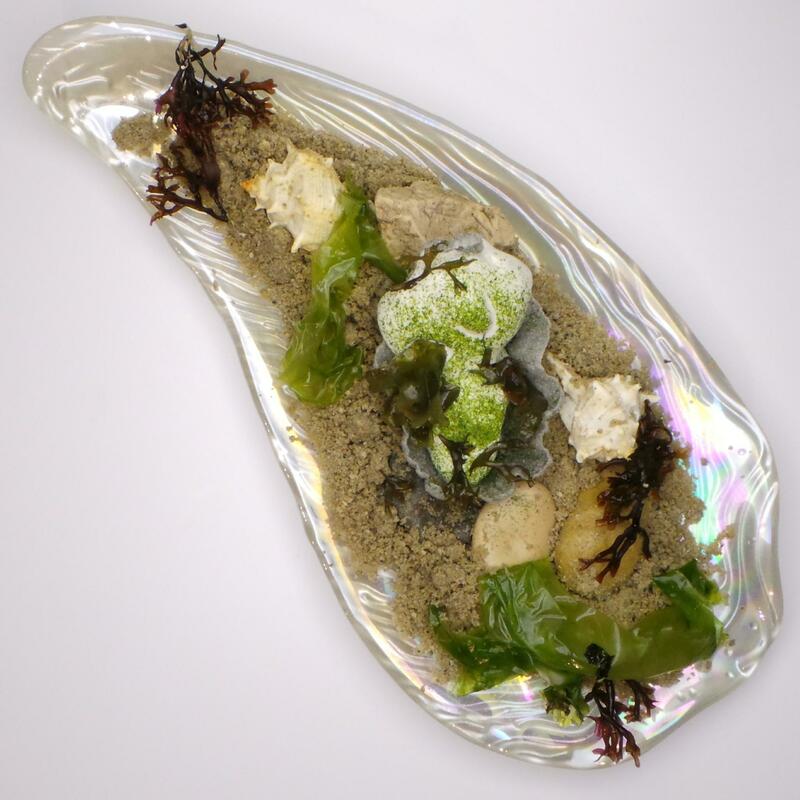 The third dish that was presented was a tempura oyster, seaweed powder and oyster meringue. He said that there was no culture to cultivate oysters in Spain so he feels the need to cook them properly. “Deep frying is a very important technique in the south of Spain so this is the method we use for the oysters,” he said. Dacosta then plates the deep fried oyster into its shell and then makes a traditional mayonnaise which uses oysters instead of eggs as protein. 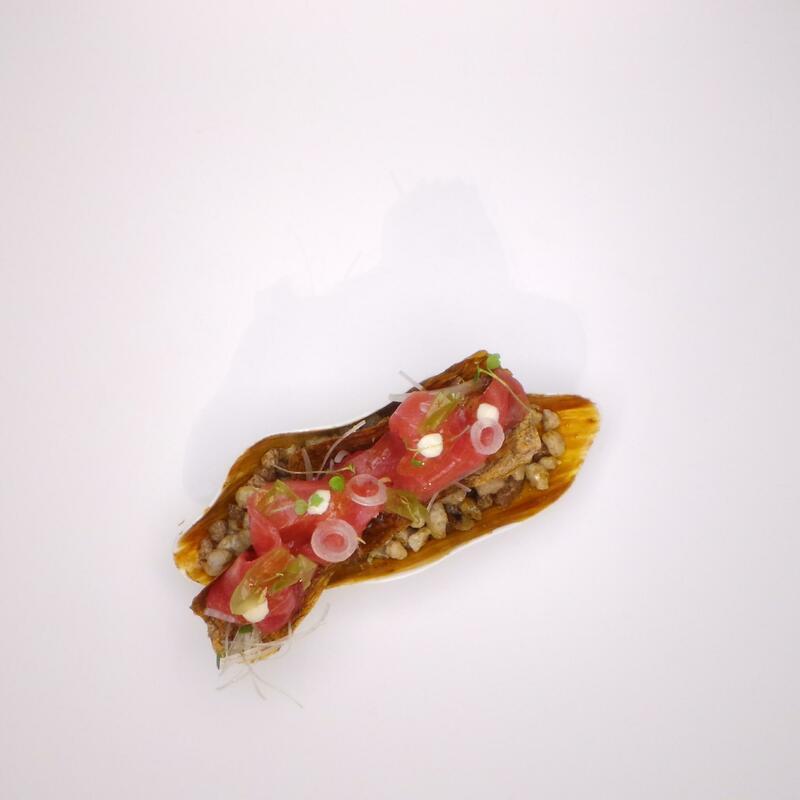 Very few words can describe the inventiveness of Dacosta’s cuisine so I would urge you to take a look at the video presented at Zwolle by Dacosta. Here you will see Dacosta’s cuisine which is easily one of the most avant-garde cuisines in the world.